Rewritable disc offers convenience and quality. Great choice for cost-effective data management; use for routine backups, authoring/editing multimedia projects, large file storage, and more. Share large files easily with associates, friends, and family. Superior archival life ensures performance for years to come. Rewritable up to 1,000 times for long-term use. Read compatible with DVD playback devices for hassle-free sharing. 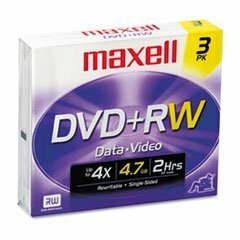 Disk Type: DVD+RW; Capacity (Video): 120 min; Recordable Format: Rewritable format-may record and re-record data up to 1,000 times. ; Capacity Range (Data): 4.7 GB.